How on earth did that happen? It seems a mere moment ago I sat cradling a minutes old newborn, blinking his big blue eyes at me and trying to work out exactly how he got here when he was so nice and cozy, and yet suddenly, a year has passed, and those big blue eyes are full of mischief and laughter and love. At 1, our beautiful Beetle is an absolute delight, and each and everyone of us are totally smitten with our little ratbag. It went without saying that this was an occassion to be bringing out the crafting big guns. It’s our last first birthday (I’m not crying. I just poked myself in the eye with an emotion), and I was going to go out with a bang. Holy over-enginneered invites Batman. We started off with the cake smash photo shoot – I made a cute little orange ladybeetle cake, and set up my portable photo studio in the dining room, including stringing up some bunting I made ages ago for my photography business. Then we had a blast shooting his smash session – even if he didn’t really get the whole thing! Next step was making up the polkadot background in Illustrator using the colours in the photo as a guide. 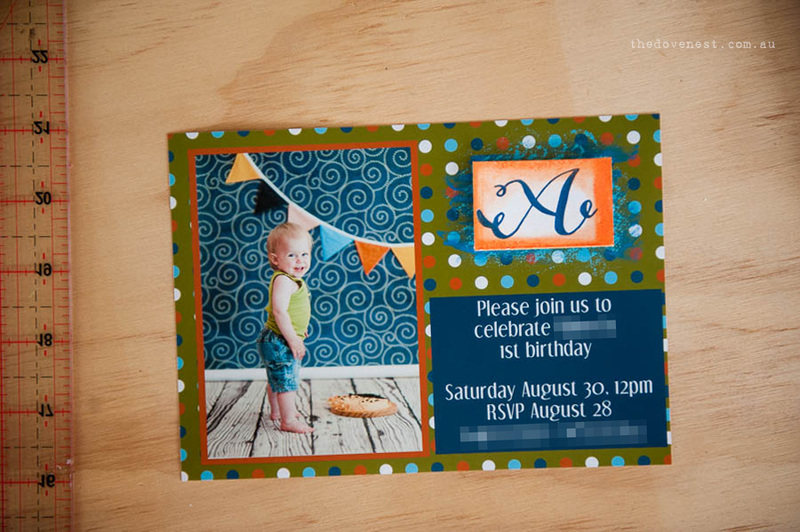 Then into photoshop I went, and pulled together the main body of the invitation, printed as a 5×7″ photo, before moving on to the piece de resistance – the monogram. I filled a page with calligraphy A’s, and picked the best. It was then scanned and tweaked, before being sent off to be made into a letterpress plate. I had a lovely time running off a stack of navy letterpress monograms, before going nuts with the gelatos to border them. A smear of paint, a dab of distress stain, a piece of 3D foam tape, and voila, a very cute little invitation! Of course, the paper goods couldn’t end there. 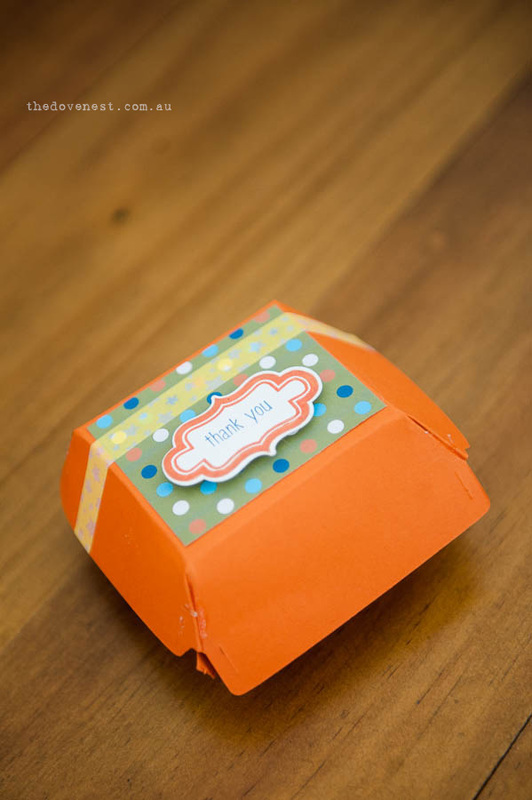 With the help of a cute little die and my Big Shot, I made up a heap of this little boxes with the polkadot pattern and letterpressed labels. These were meant for the cake, for the guests to take home. 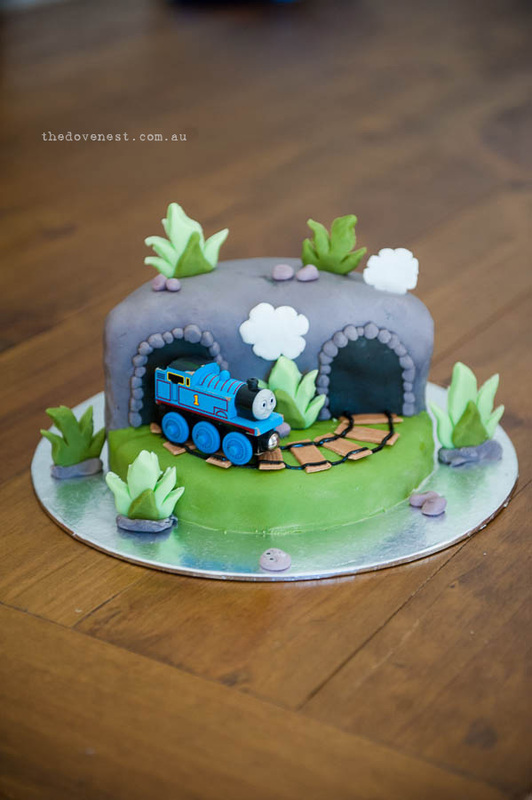 Using this picture as my inspiration, I made out train-mad little man a Thomas The Tank Engine cake. 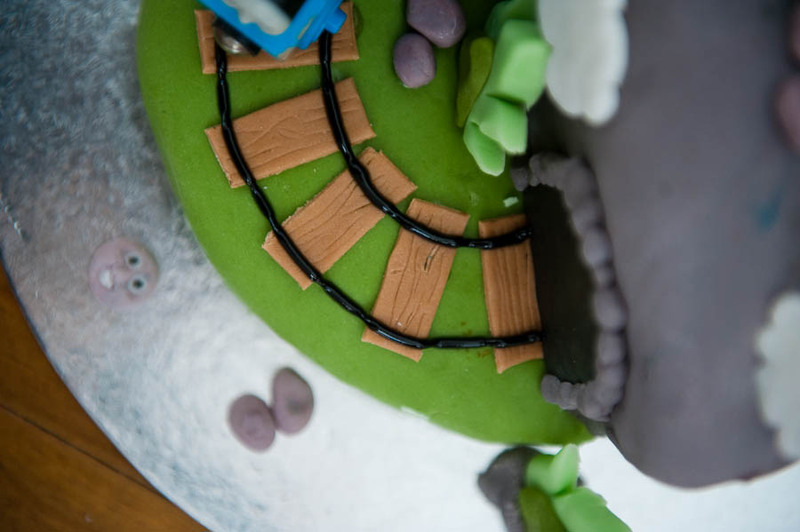 One of my favourite details was the woodgrain rail sleepers. But of course, I am a goose of the highest order, and completely forgot to send the boxes AND the cake home with our guests, so instead I used the boxes to hold the cupcakes I made for Beetle’s music class which was on his actual birthday. 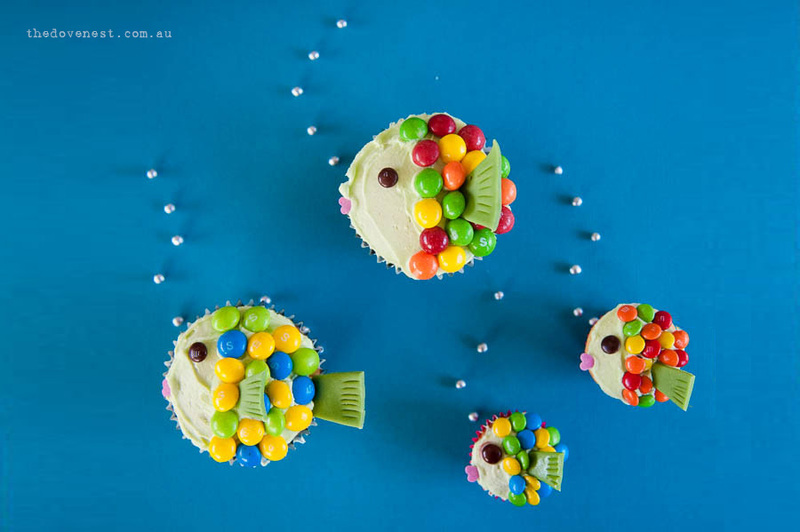 Inspired by this photo, we made a school of little fishies!